The eviction notices, sent earlier this month, "caught many families unprepared," according to activists. 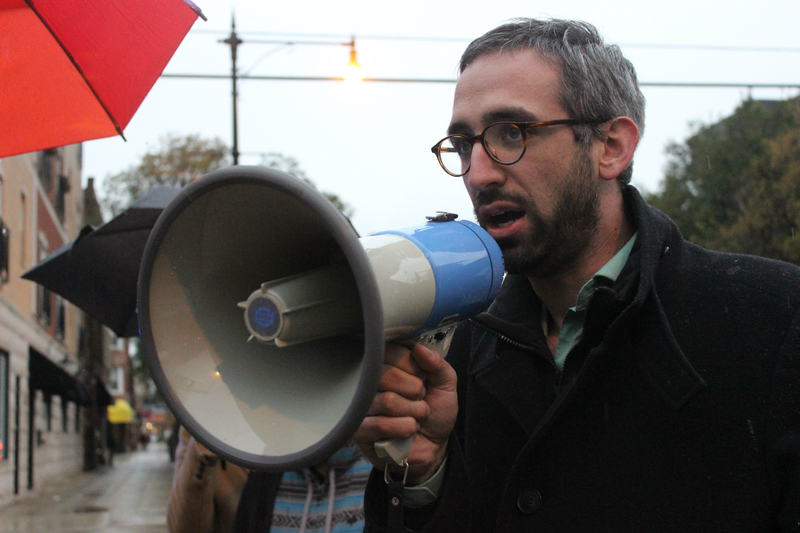 LOGAN SQUARE — Housing activists and state Rep. Will Guzzardi (D-Logan Square) led a protest in Logan Square Wednesday in response to what they say is landlord M. Fishman & Co.'s recent move to evict dozens of tenants from his newly acquired building at 2936 W. Palmer St. The protest was held Wednesday in front of Fishman's office at 3215 W. Fullerton Ave.
Fishman bought the building on Oct. 5. Soon after, the tenants received eviction letters and were told to move out by Nov. 30. The move "caught many families unprepared," according to Logan Square Neighborhood Association, the group that put on the protest. "This hardship is especially severe for those who have children attending their neighborhood public school, seniors and disabled residents, and those who live paycheck to paycheck," the group said. 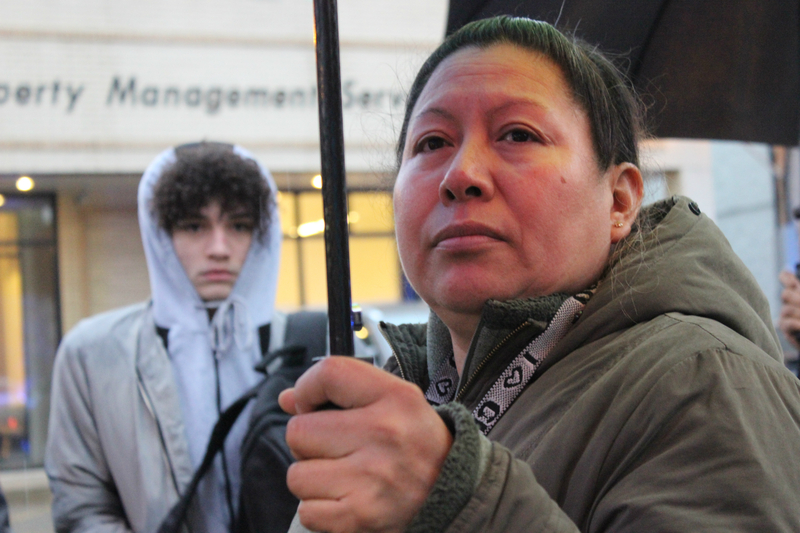 One such tenant is Esther Gonzalez, 46, who has lived in the building for 18 years. "My daughter is at Darwin, and she doesn't want to leave. She loves her school, and she wants to stay at her school until the end of the school year," Gonzalez said through a Spanish translator at the protest. "We need more time to be able to find an apartment to live in, especially in this area because the rent is so, so, expensive," she added. Gonazalez is among a dozen tenants who are demanding M. Fishman & Co. push back the move-out date to June 30 so they have more time to find new homes and their children are able to finish out the school year. The tenants are looking to set up a meeting with Mark Fishman to come up with an agreement. Fishman didn't respond to a request for comment earlier Wednesday. When the protesters attempted to enter Fishman's office to deliver their letter, his staffers wouldn't open the door. Preparing to be kicked off the property, the protesters moved to the public sidewalk in front of his office. A police car showed up, but officers did not intervene. Gonzalez was joined by Ismael Cabreras, 76, who has lived in the building since 2003 and in the neighborhood for nearly 30 years. "I work really hard to pay the rent. What's happening here today is an injustice for people like me, but also for the families in the building who have children," Cabreras said via a Spanish translator. Cabreras described himself as being "very sick," and said moving in November would be incredibly difficult given his health challenges. Guzzardi also spoke at the protest, telling the two tenants and their supporters that "we're all in this fight together." "I am going to use all of my power as your state representative to make sure your families can stay in their homes as long as possible," the legislator said. The state House member has been pushing the state to ditch laws banning rent control in Illinois as rental markets in Pilsen, Logan Square and Hyde Park heat up. At the protest, he touted the effort. "These kinds of situations destabilize communities," Guzzardi told DNAinfo. "We need to do everything we can to prevent that from happening. I think that includes neighborhood level, block by block, decisions like what's happening here. And there's also structural policy-level decisions ... for instance, rent control [would] make sure that landlords can't egregiously raise rents on their tenants and push them out of their homes," the legislator said. 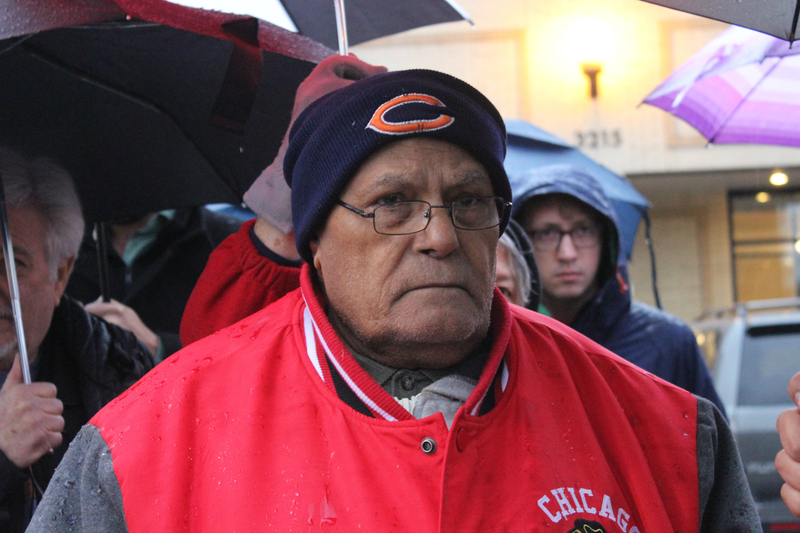 Ismael Cabreras, 76, faces eviction from 2936 W. Palmer, where he's lived since 2003, according to the Logan Square Neighbors Association. 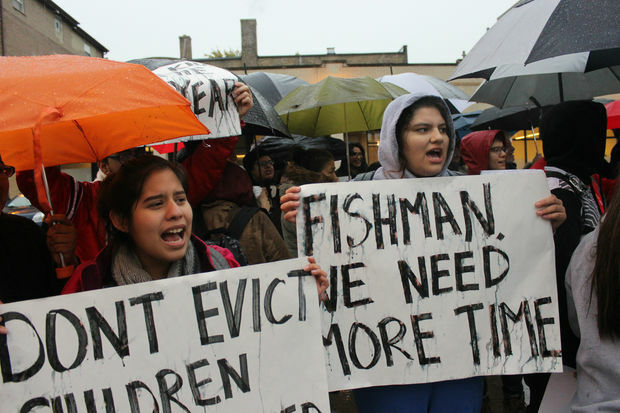 Fishman owns dozens of properties in Logan Square and has become a target of local housing activists who fight gentrification. He bought his first building in the neighborhood 26 years ago and has argued that he's helped the community thrive by investing in Logan Square long before the neighborhood became a highly desirable place to live. "I believe the fundamentals of real estate were (and are) as good as it gets: excellent building stock, plentiful green space and transportation," he told DNAinfo Chicago in 2016. "I have the same feelings and excitement that I did 26 years ago when I purchased my first building — the boulevard system in Logan Square truly sets it apart from any other area in the city." State Rep. Will Guzzardi addressing the crowd.